Bob was at home when he suffered a stroke in 2011. He was found on the floor and was taken straight to hospital. He spent some time on the stroke unit of the local major trauma centre before being discharged to a specialist residential unit specifically for people with a brain injury. Early in 2012 he was ready for discharge, and he was referred to Headway by his Physical Disability Team. Bob had been in the rehab unit for nine months and had not been home since his stroke; a care package was being put in place but there were concerns about how he would cope. After six or seven months of intense rehab, Bob’s stroke had left him with left sided weakness and the use of his left arm is still very limited, which makes it difficult for him to cook for himself. At the time of discharge, Bob was also mainly limited to his wheelchair and was at risk of social isolation. A Headway Community Brain Injury Advisor made contact with the family and initially invited Bob to his local Headway monthly social and support group. Later Bob was referred for assessment for the hub service and started to attend one day a week. Bob found the skills development useful and recently moved up to two days a week so that he could access the life skills cooking session. When he left the rehab unit, Bob was only able to make himself a cup of tea. Bob has carers who assist him on a daily basis with his meal preparation at home. 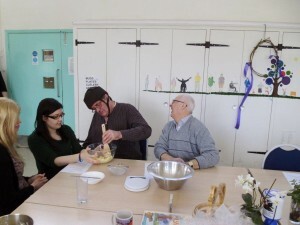 In the life skills session at Headway, Bob works as part of a group cooking a recipe together to develop their skills. Bob has already shown some marked improvement since starting with the hub service. He can now recall events from the previous week, such as recipes discussed and meals made, as well as recalling recipe steps discussed earlier in a session. He is able to chop soft vegetables independently but still needs encouragement to use his left hand to stabilise harder vegetables. He is now able to stand independently in order to stir ingredients in a pan for a short time or to wash his hands. Bob could complete more cooking tasks in the session independently, without the one to one support of a member of staff. This would build his confidence and independence. Once he knew which equipment worked for him, he could get this equipment to use at home, too. He could then help to prepare more of his own meals at home. Bob’s dream is to be able to give something back to his family in return for supporting him through this tough time. He wants to be able to cook them a meal from scratch without their input. This would be a great achievement for him as well as providing him with a great deal of satisfaction.